For bill payment, please login through our Patient Portal. 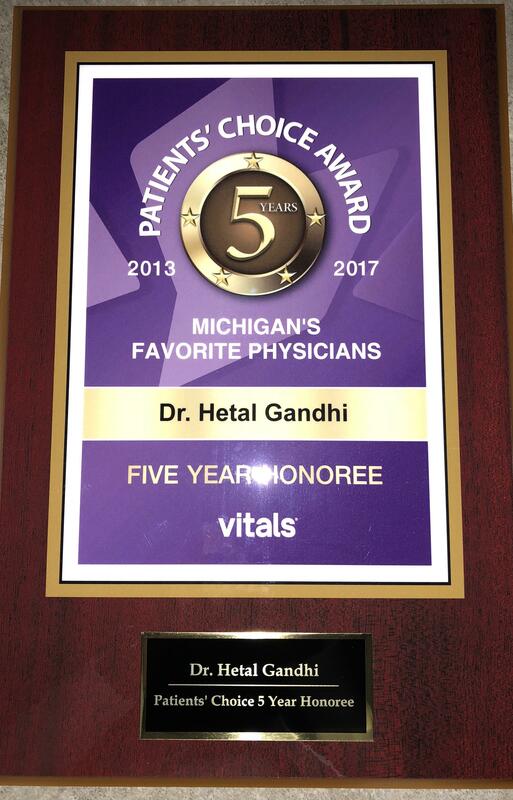 Hetal Gandhi, MD, FACP believes that her career as a primary care physician at Synergy Medical in Livonia, Michigan, is not only to heal but also to educate her patients and their families about their medical issues, so that they can work in partnership to achieve optimal health. This cooperative partnership is often instrumental in the management of many chronic illnesses. Board certified by the American Board of Internal Medicine, Dr. Gandhi has been a practicing internist in Michigan for more than a decade. Dr. Gandhi also has a particular interest in diabetes and weight management. Relatedly, Dr. Gandhi has extensive experience and keen expertise in treating a range of complex medical issues, including high blood pressure and high cholesterol, as well as multiplex heart conditions, stomach issues, arthritis, and breathing problems. Besides English, we offer four different languages spoken at the office, including: Spanish, Hindi, Gujarati and Albanian. Come see us for all your primary care needs. "Love this medical practice! Doctors and staff are so caring. Never a long wait." "Dr. Gandhi is an excellent physician. She has a great bedside manner." "I'm very happy to have found this doctor. Staff is very helpful and friendly." "The med tech, phlebotomist, and nurse practitioner are all wonderful and professional." "Best doctor I have ever had. She is so nice, caring and very easy to talk to." "Best doctor I have been to in many years. So caring and takes time with patients." "Quick and flexible appointments and very accommodating. Highly recommend this practice." "Experienced doctor and staff. Very pleasant experience." FACP, what do these letters after your doctor's name mean? The ACP is the American College of Physicians which is the largest society of internists in the world. Fellows of ACP are a distinguished group of doctors dedicated to continuing education in the medical practice, teaching, or research. Fellowship is an honorary designation given to recognized ongoing individual service and contributions to the practice of medicine. Fellowship in ACP is a mark of distinction. It says that your doctor has made special efforts to be a better doctor. Ultimately, it says your doctor cares about delivering high-quality health care. A nurse practitioner (NP) is an advanced practice registered nurse (APRN) classified as a mid-level practitioner. A nurse practitioner is trained to assess patient needs, order and interpret diagnostic and laboratory tests, diagnose illness and disease, prescribe medication and formulate treatment plans. According to the American Association of Nurse Practitioners, a nurse practitioner is educated at the masters or doctoral level to provide "primary, acute, chronic, and specialty care to patients of all ages and all walks of life"
At Synergy Medical, we accept most major insurance plans. Here is a short-list of some of the most popular plans we accept. Please contact our office if you do not see your insurance provider listed. "Love this office, Dr. Gandhi always has time to talk, and listen. She is very complete in care and compassionate about her patients." 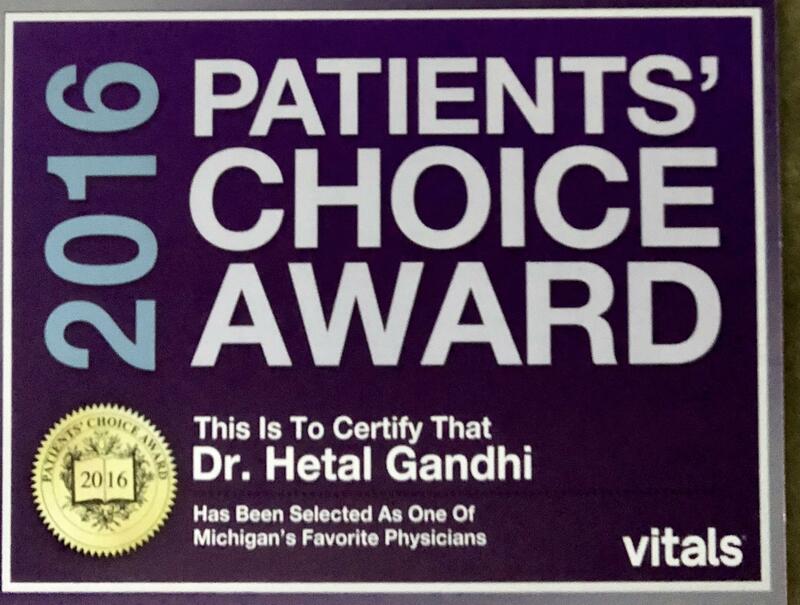 "Dr. Gandhi is pleasant, knowledgeable, and efficient - everything I have been looking for in a physician. Highly recommend!" "Dr. Gandhi is more helpful and accommodating than any doctor I've seen in years. Can't imagine going to another doctor!" "Excellent. I've been Dr. Gandhi's patient for over 6 years. I love the personalized interaction and exceptional patient care that she provides." "My experience was great. Very professional and friendly. Met with Dr.Gandhi and she is very friendly." "Dr. Gandhi is a very thorough and compassionate provider. The office staff is friendly and caring as well." "Staff is the best ever!!! Dr. Gandhi has an excellent bed side manner and really cares about her patients." "Awesome since day one! She takes the time to listen, she explains thoroughly, always smiling and truly cares about you." by calling the answering service at 248-544-6943.